Store intelligence gathering made simple. Did all the stores receive the latest shipment? A field survey is the best way to get answers fast. You could use a third-party survey website but the manual data entry process would be time prohibitive. Plus, there’s no way to customize the form, route the data to members of your team or integrate the findings into your platform because you don’t actually “own” your results. The fact is, third-party survey websites only let you do a fraction of what you can do with AccuStore. Our flexible online and mobile surveys let you gather site intelligence from employees, vendors or anyone who has the information you need. You’re ready to get answers in minutes. Just customize it as you like and hit send. 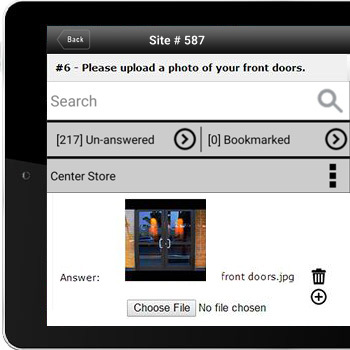 Instantly create and customize surveys. Get information inside or outside your organization. No need to reinvent the wheel every time. You decide who can view, interact with, review or change data. Add photos to your survey or request photos from survey takers. The results integrate with your database, so you can quickly determine what needs to be done. AccuStore gets everyone on the same page, with a complete understanding of every location.